Life has been crazy here (weather included.. boo, hiss...) and after working through the past weekend, even the days of the week became a bit mixed up for me. I figured all this was a good excuse reason to finally spend a gift certificate from Mad About Patchwork that I had been saving since... ahem, last summer (can't believe I held out this long... excuse me while I pat myself on the back for showing such restraint... hee hee). 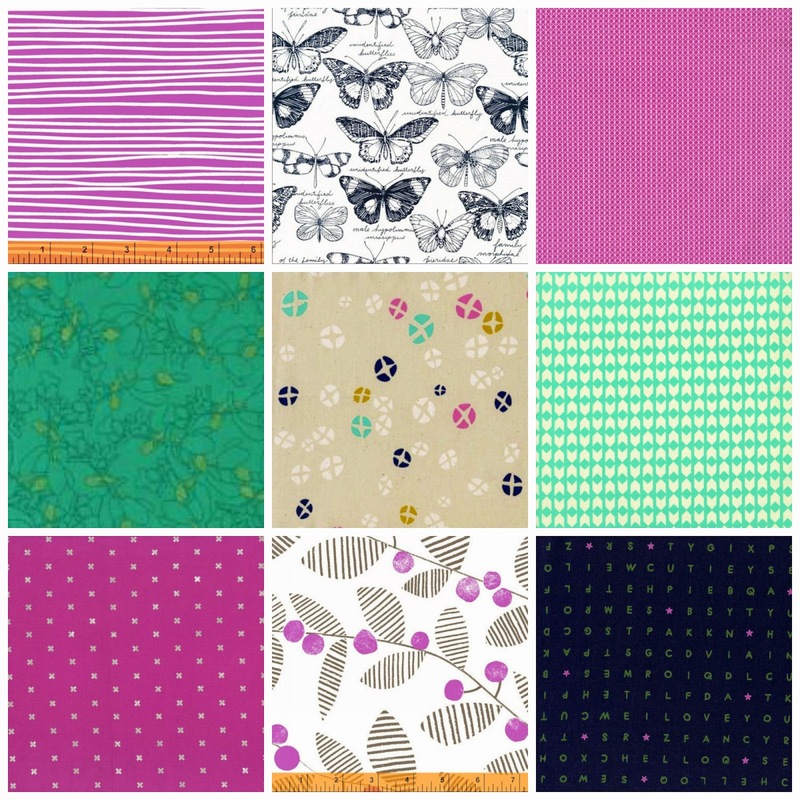 Just a few of the "pretties" I selected from Pam's lovely shop, Mad About Patchwork. I love fabric. Seriously. It's kind of crazy just how much. Ha! That's no secret, you're thinking. 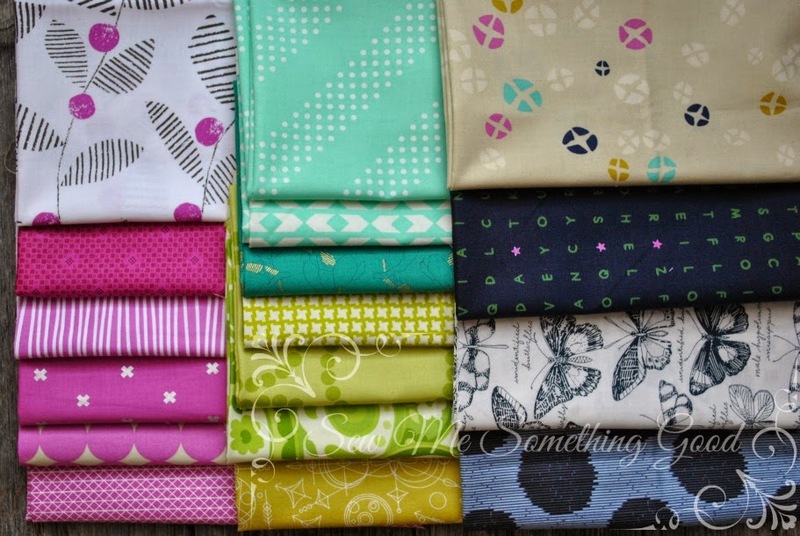 Well, okay, so you may have guessed I'm a bit of a fool for fabric. So happy with this selection that I put together virtually (it can be tricky when you haven't seen any of the fabrics in person). More exciting is that I even have a project lined up for these beauties. This week though, this fool for fabric, came home from work to discover a wonderful parcel. 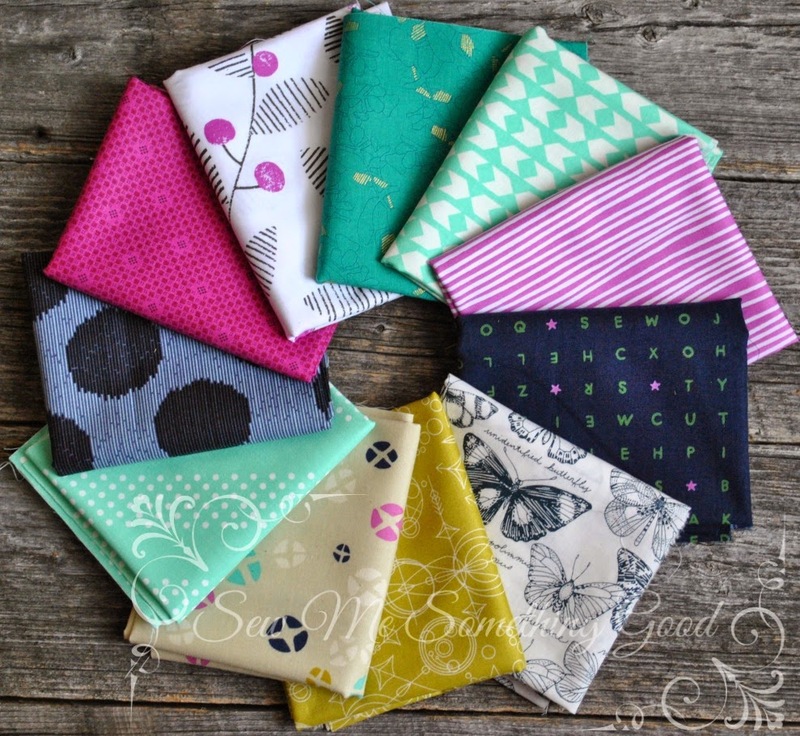 Chock full of a selection of fat quarters that I decided to treat myself to. I have been longing to lay my hands on some Cotton + Steel basics and the fabric in the top right hand corner became the guide to the rest of my choices. I'm in love. Thanks so much to Pam and her staff for the treat of shopping with them (that gift certificate was so worth waiting to spend ;o). I can hardly believe that this project dates back to a year ago. 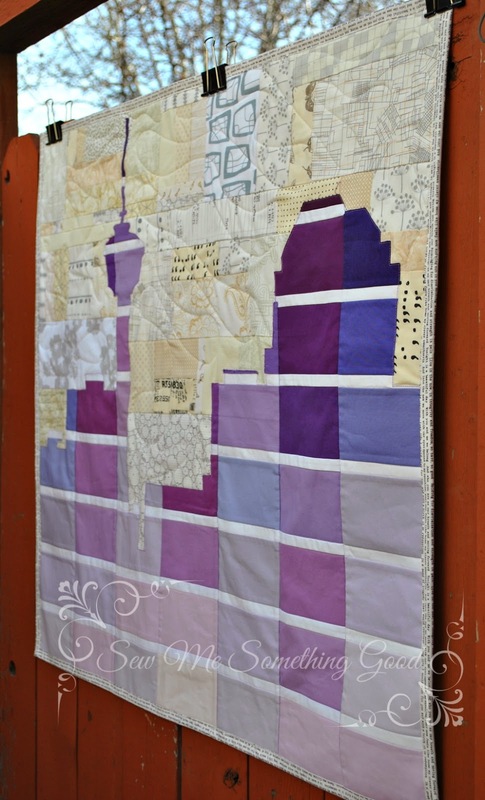 Maybe you will remember "Paint the Town" as my entry in the 2014 Pantone Quilt Challenge: Radiant Orchid? The Calgary Tower is a recognizable landmark of this city and works beautifully as a paint chip silhouette. In any case, I'm glad to be able to share this recent finish. 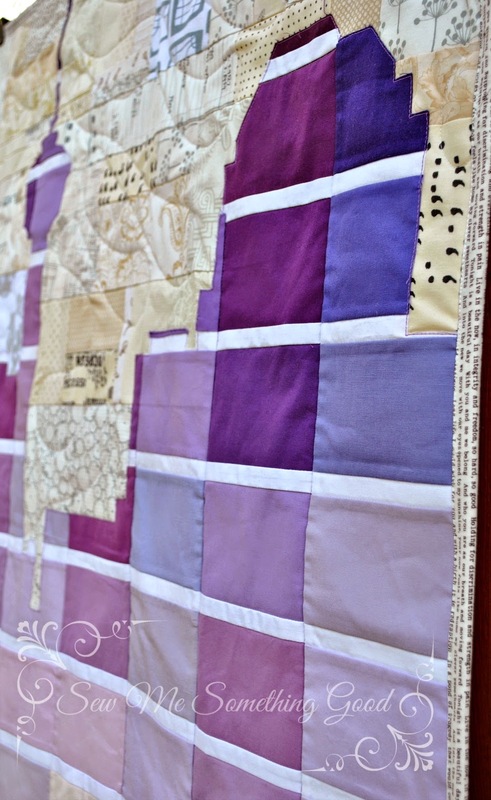 This piece has been one of those that took me far too long to decide how I would quilt and bind. It was a matter of too many ideas! Sounds silly, no doubt, but I think I was mostly stuck on how to proceed for fear of messing this up. Love all those solid purples for the paint chips! Finally, this winter, I decided that it needed finishing, not perfection. ;o) Funny, how that freed my mind up to take action. The quilting couldn't be simpler, really. I outlined the buildings and the seams between the paint chips to keep the silhouette the feature, while stitching long loops on the low volume background to symbolize the fresh, clean air our city enjoys. A text print in purple answered my problem of what to use for binding - obvious now, but something I didn't even consider earlier. 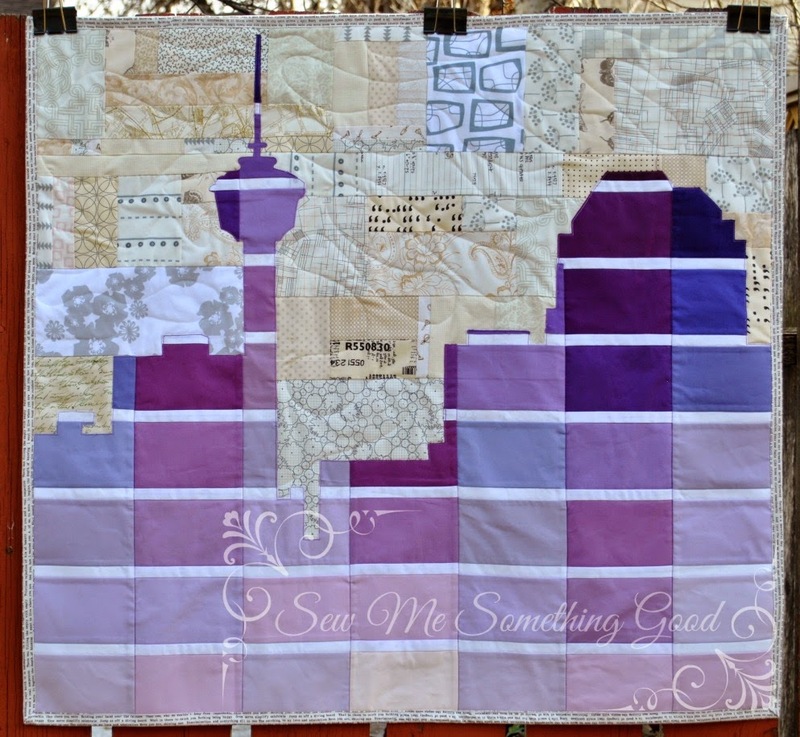 This mini quilt makes me so glad I entered the challenge (pushing me to design something far different from my usual aesthetics and colours) and gives me a memory quilt for that day in the future when I won't be living in this city. 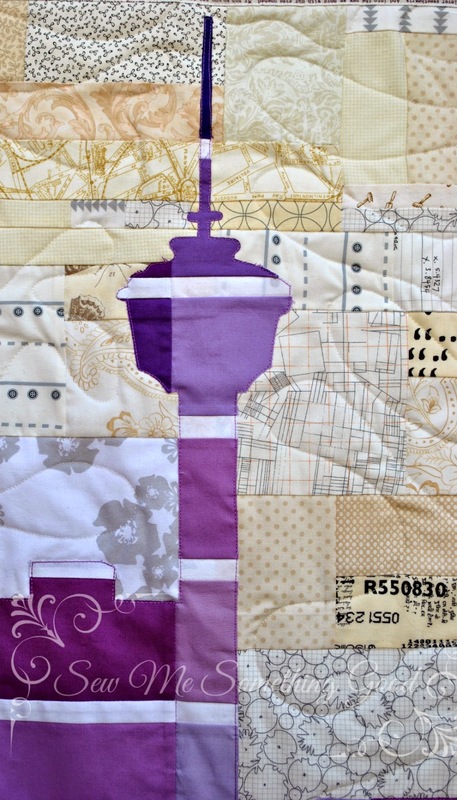 "Paint the Town" a mini quilt tribute to Calgary's downtown skyline.